Five-time world champion Viswanathan Anand might not have had too many encouraging results in recent times, but the chess Grandmaster today expressed confidence that he would come out of the rough patch in 2013. Anand said although he was yet to figure out the exact problem with his game, he assured there was no lack of motivation and the coming year would be better for him. "If I figure out the exact problem, I will be able to do something about it, but motivation is certainly not the problem. It is not that I am uninterested. It's just that there's a problem that I need to fix," said Anand. "Last year I didn't get to play in a lot of tournaments. But in the upcoming year I would be playing more and hopefully, I will be able to solve the problem as I play in more and more competitions. Looking forward to the next year," he added. The 43-year-old has a packed schedule next year with almost seven tournaments till July before the World Chess Championships in October-November. 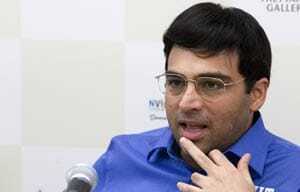 But Anand said that it was something he would be able to deal with it comfortably. "I will be playing in five tournaments till May and might be a couple of more after that, so it makes it seven. There would be the World Championship in November, which means in July or so, I would have to stop in July. "Obviously, it is difficult as you are always thinking in match mode. It is tough but you can't complain that you are playing World Championship every year. It is something you have to deal with. "I am just trying to get myself ready for the big challenges. There will be some scheduling and I will have to plan everything but that's not a problem," said Anand after launching the NIIT Mind Champions' Academy at Global Indian International school here today. Asked what more is left for him to achieve, having already won five world championships, Anand said, "I don't sit and decide the targets. I just go to a tournament and try to do my best, and improve my rankings." The GM also reiterated that "I have no retirements plans". Anand admitted that the game of chess has changed tremendously over the years and competition has also increased. "Chess has changed a lot over the years and you have to keep evolving with it. Firstly, the technology has changed. The information is now available in databases and computer has become an essential device for every chess player. "Dissemination of information has become easy and accessible. Also, now a days more and more people can watch chess online," he said. "There is much much more competition these days and the playing field has been levelled. Many more countries are now playing the game," Anand added. Asked how he prepares for competitions, especially against high profile opponents, Anand explained: "You try to look at the game of your opponent and plan accordingly. But it is a hit and miss, a lot of guess work is involved. But if you plan, you will get some percentage right." Meanwhile, talking about IOA's suspension, Anand insisted that the ban is unlikely to affect the sportspersons in a big way. "I don't see the IOA ban affecting the athletes in a big way. Of course there is going to be some disruptions but it is good that it has happened in 2012 and not in 2015, because then it would have been much closer to 2016 Rio Olympics. "So we have some time to solve this problem. Anyway the athletes will keep on training," Anand said.